barton originals: WHAT IS IT ABOUT MARIE? WHAT IS IT ABOUT MARIE? As a queen, by the time she was executed during the French Revolution you could say that she was not very popular. Quite a change from how she is almost revered now by so many. 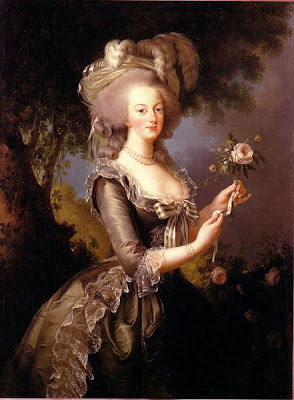 Marie Antoinette had a relatively short and rather tragic life. She died at the age of 37 after a very short trial and accused of some heinous trumped-up charges. Is this why we tend to champion her today? Is it the romance and beauty she brought to the court? The over-the-top glamour of her life during the heyday of Louis XVI? A time in history of pomp and ceremony which will probably never be equalled? In today's world, Marie is almost a cult figure. Books, memorabilia, movies and art work are dedicated to this woman who lived over 200 years ago - which brings me to the point of this posting. The very talented Tristan Blakeman of Enchanted Revelry is having a giveaway in celebration of attaining the rather enviable position of 500 followers to his blog. For those that follow Tristan's blog, we know he likes glitz, glam, all things beautiful - and Marie. 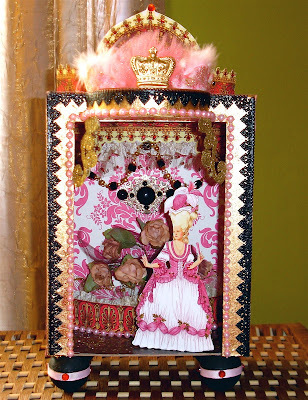 He has created the absolutely beautiful mini theatre (shown below) of Marie in her rose garden. For your chance at winning this stunning piece of art, please check out this post on Tristan's blog. Isnt this fab Sue, I've entered too !I dont know what it is about Marie Antoinette , I think the tragedy of it all has helped her reach the iconic status she now has though. I wonder what she would think if she were able to see how she is thought of today ? ! I think her life was a LOT LESS tragic than the majority of her subjects at the time, she just got to wear prettier dresses and live that short life in luxury. We all know that she never said "Let them eat cake " now but I still don't understand her recent near saintly status... it's like enshrining Imelda Marcos for her shoes! Actually, she was greatly maligned during her reign as Dauphine, and then Queen, of France. There were vicious and scabrous things written about her in the press and in handbills - but this is no different than the vicious and scabrous things that are written about our politicians right now! She was not callous nor unsympathetic to the poor. And she did much to lighten their plight. She was in the wrong place and the wrong time. Her "lifestyle" of luxury and excess was the way royalty LIVED then. It was not that she was worse than others - facts hav proven she was far less self-indulgent. On the other hand, this was the Queen of France - not a snooty spoiled Valley Girl with unrealistic expectations of what is rightfully hers. Has there ever been a European monarch who did NOT live a life of privilege?! Thanks for the giveaway plug, Sue!